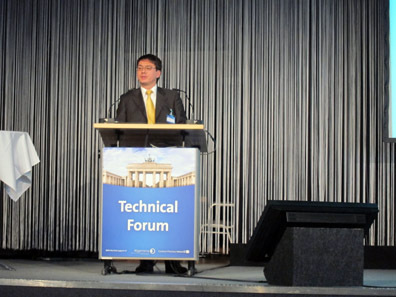 February 12, 2013 – One of the main events of the World Money Fair in Berlin always takes place in a conference room before the opening of the fair: the Technical Forum. On Thursday, January 31, 2013, the event was well attended by numerous representatives of the supplier and coin producing industry as well as of national banks and mints. To make sure that even those who would not feel as firm with the English language could follow the often very technical details, Cookson Precious Metals sponsored again a simultaneous translation. 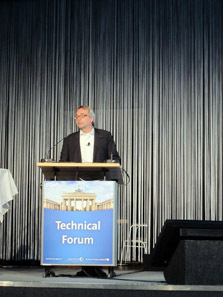 Albert M. Beck opening the Forum. Photo: BS. Dieter Merkle, Schuler Pressen. Photo: BS. … and once again Dieter Merkle of Schuler Pressen and Spaleck’s Thomas Hogenkamp took over conducting commendably through the day. Their statement that the quality of the papers had continually increased from year to year was indeed confirmed later. The following 19 presentations were limited to 15 minutes each. All speakers without exception kept perfectly in time permitting thus a discussion after every three or four presentations. The intensity of some of these discussions and the questions from the audience attested the high quality of the contributions and the interest they arose among the listeners. Dr Konstantin Li, Mint of Finland. Photo: BS. Although the first topic, ‘Security’, was represented by only one paper, it will certainly continue to be one of the main themes we can observe in the coin business. 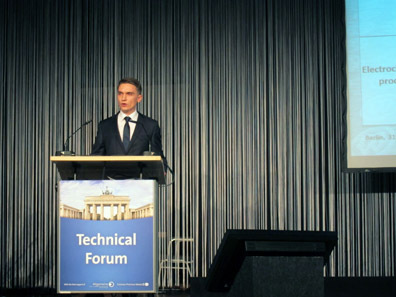 Dr Konstantin Li (Mint of Finland) spoke about ‘High-speed sensing technology for detection of concealed security features of coins’. The Mint of Finland in cooperation with IDSens has developed a new authentication system called CoinTune™ based on electromagnetic acoustic transducer technology. Digitally recognisable security features will be integrated into the coins’ macrostructures. According to the lecturer that can be easily done with the currently used production systems. A CoinTune system on the other hand is integrated into coin processing machines like sorting units in mints, banks and other places enabling an immediate recognition of counterfeit coins. Dr Xianyao Li, Royal Canadian Mint. Photo: BS. The second section was dedicated to ‘Blank materials’. 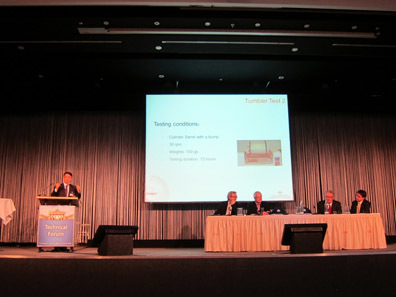 Dr Xianyao Li and Dennis Webber (Royal Canadian Mint) explained ‘Advanced durable Nickel plating by a double anneal process’. SM&RT (Secure, Modern and Resistant Technology) is the RCM’s new concept of improving their coins. Their double anneal process combines the advantages of pre-annealing and post-annealing rendering thus the coins harder and giving them a better wear-resistance as proved by salt bath corrosion tests. Aziya Ibrayeva, Kazakhstan Mint. Photo: BS. 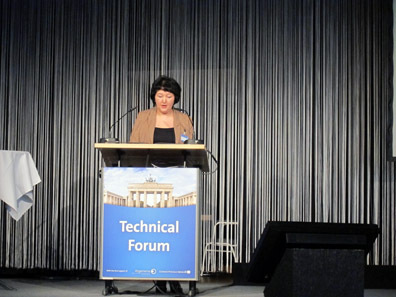 Farit Tuganbaev and Aziya Ibrayeva (Kazakhstan Mint) presented ‘Production features of coins with Tantalum elements at Kazakhstan Mint’. They distributed some blanks among the audience, and so everybody was able to feel that tantalum blanks are indeed much heavier than silver blanks. The rare material is, however, also much more expensive than silver and therefore suits particularly the production of commemorative coins. Dimitrina Fileva, Amera. Photo: BS. Dimitrina Fileva (Amera) gave a wide and detailed overview on the various kinds of bi-colour coins in her paper ‘Bring color into circulation!’. She explained that those coins composed by homogenous alloys are the most expensive and rather difficult to recycle. The euro coins, for example, cost about 2.5 times more in production than coins made with an alternative electroplating technique. Dr Wolfgang Bretz, Wickeder Westfalenstahl. Photo: BS. 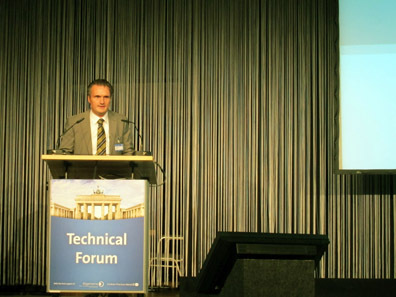 The following lecturer, Dr Wolfgang Bretz (Wickeder Westfalenstahl), focused in his paper ‘Effect of slide grinding processes on edge optimization of Multi Clad coins & Flip-Flop coins’ on how to reduce the scrap material that bi-colour coins made out of two homogenous alloys necessarily produce. Instead of remelting laboriously the metal he proposes another approach by striking flip flop coins using the inner and the outer rings from one and the same metal strip in reducing thus the amount of scrap metal considerably. Ingo Löken, Spaleck. Photo: BS. 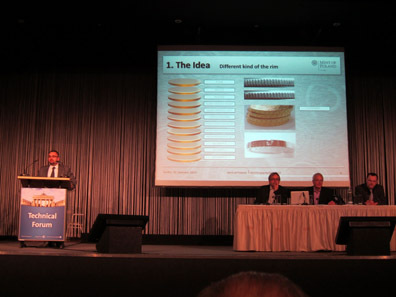 Additionally, his colleague, Ingo Löken (Spaleck), assisted by giving a descriptive idea of how 3 or 5 layer sandwich metals are arranged for producing the flip flop coin metal strips. His comparison of a multilayer coin to a Black Forest cake will be unforgettable for all who listened to him. Raul Montero, Cookson Precious Metals. Photo: BS. Raul Montero (Cookson Precious Metals) went really into detail, so to speak. 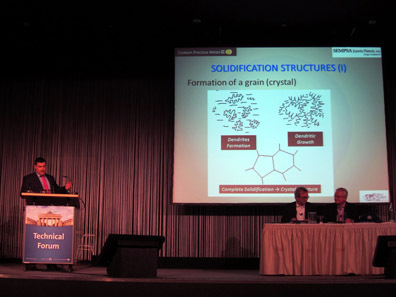 His paper ‘Grain Size and Microstructure of Precious Metals Alloys – Impact on the Surface Quality of Collection Coins’ demonstrated why a small grain (crystal) size of the applied metal is highly desirable: the smaller the grains the smoother the surface. His product Sempsa™ Grain Refiners is based on noble additives that retard effectively the grain growth during the annealing process preventing thus the unwanted orange peel surface of coins. A break concluded this section. The breaks were sponsored by Allgemeine Gold- und Silberscheideanstalt and did not only help to ‘air’ the brain but, above all, were a most important moment for discussing and meeting people. Gunter Blauth, PemTex. Photo: BS. 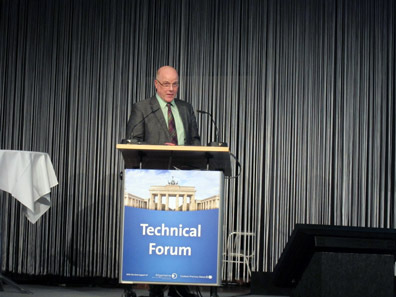 After the break the forum continued with ‘Tooling Electro-chemical Process’. 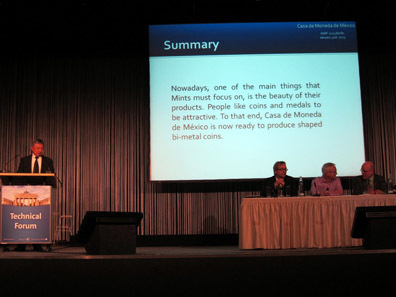 The title of Gunter Blauth’s (PemTec) paper ‘Pem Technology as best in practice for Mints (Münze Berlin)’ promoted the advantages of Pem Technology which reduces the production steps of coins and, additionally, requires no hardening while enhancing the surface quality of the coins as experienced in tests with products of the Berlin Mint. Lukasz Karda, Mint of Poland. Photo: BS. 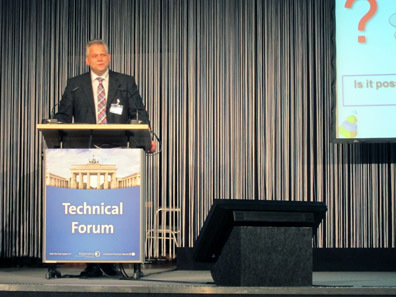 Lukasz Karda (Mint of Poland) made a ‘Comparison of alternative technologies of die production: hobbing, electrochemical process’. He underlined the various advantages and disadvantages of both technologies. So, just to give an example, hobbing renders more details while the electrochemical process is much faster and allows other coin shapes than round ones. The following section was dedicated to another topic of growing importance: Tooling Laser. Albert Post, Royal Dutch Mint. Photo: BS. 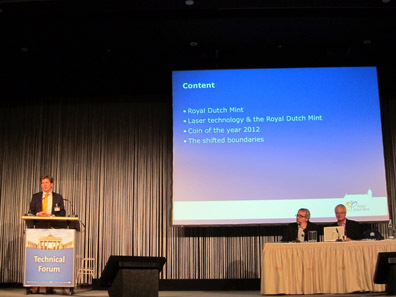 Albert Post (Royal Dutch Mint) told the audience in his paper ‘Shifting the coin design boundaries with laser technology’ that the Dutch mint was the first to apply laser technology for the die production as early as 2008. Recently a Royal Dutch Mint’s product was awarded Coin of the Year for the innovative implication of minted photo images, particularly a QR code. Mr Post labelled the addition of further micro security printing ‘shifted boundaries’. These images can actually contain up to six multiple views and very fine structures of lines. Nico Lubold, Lang. Photo: BS. 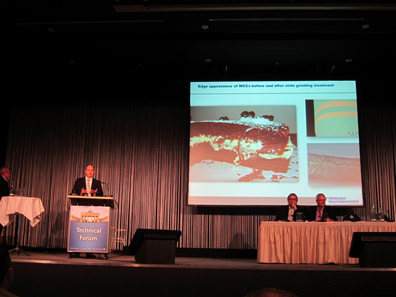 Nico Lubold (Lang) went even more into detail: ‘Requirements for Lasermachines’ gave an overview on what laser technology can do – and what it cannot do, at least not yet. Laser can, according to Mr Lubold, produce an enhanced surface quality and engraving frosting may constitute a real alternative to sandblasting. Hidden effects and a Lang product called Rainbow effect are also positive possibilities. However, Mr Lubold admitted that laser is not the universal solution to all challenges and concluded: ‘Milling where possible, laser where necessary’. Siemowit Kalukiewicz, Mint of Poland. Photo: BS. The next two papers presented a new product of the Mint of Poland, a cylindrical coin. 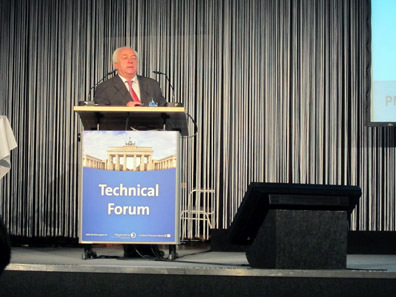 Siemowit Kalukiewicz (Mint of Poland) called this project ‘Third Side of the Coin – A new area of exploration for computer & laser technologies (Part a)’. On behalf of the insular state of Niue the Mint of Poland combined traditional and innovative processes in order to produce a cylindrical coin that had a ‘third side’ to design besides obverse and reverse. The production of the dies was the most challenging aspect, particularly the invisible segmentation of the collar die. Paul Smith, Acsys. Photo: BS. 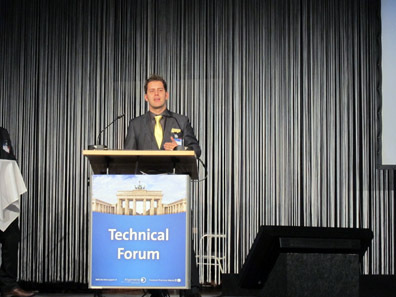 Paul Smith (Acsys) complemented in his presentation ‘Third Side of the Coin – A new area of exploration for computer & laser technologies (Part b)’ the process of how a laser digitised the plaster model of the die and these data in a second step were imported into CAD. In the end the silver coin ‘Fortuna Redux’ proposes a new way of thinking coin design promoting the combination of laser technology and CAD. Robert Newman, Delcam. Photo: BS. CAD bridges indeed to the next section: ‘Tooling Software’. Robert Newman (Delcam UK) showed how ‘Traditional technics in conjunction with Artistic CAD/CAM’ can be applied for the production of coins. Special software permits many helpful steps like analysing the scanned data in order to simulate the final produced coin. Bendable parts of figures, for instance, can be moved into various positions to fit the designer’s idea of how the design should look like in the end. Another break allowed the audience – and speakers – to breath deeply and regain energy for the last part of the day. After some twenty minutes the eager technicians reassembled for the section on ‘Tooling Material’. Franz Russ, Böhler Edelstahl. Photo: BS. 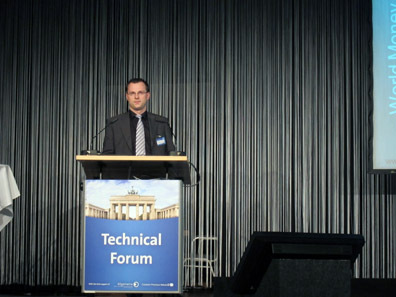 Franz Russ (Böhler Edelstahl) spoke on ‘New innovative powder metallurgical produced tool steel for the coining industry’. Böhler is specialised in producing powder metallurgical high speed steel for tools and calls these materials microclean. According to Mr Russ they have been improved in wear resistance, polishability and other virtues. Rüdiger Böhm, Rösler. Photo: BS. 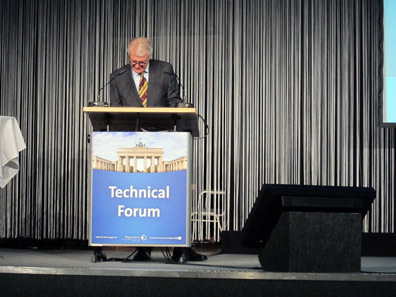 The ‘Tooling Surface Finishing’ was represented by Rüdiger Böhm (Rösler) who spoke on ‘Polishing of Minting Dies’. The central question posed by the company was whether manual polishing of dies could be substituted by an automatical polishing process. In cooperation with the Berlin Mint Rösler tried various ways and judged quite promising the vibratory finishing in a vibratory bowl. Reduction of working steps and of highly qualified employees would be the major advantages of this new surface finishing that constitutes, in addition, a highly constant process. Hermann Schürer, Economa. Photo: BS. A completely different topic was the next one: ‘Inspection’. 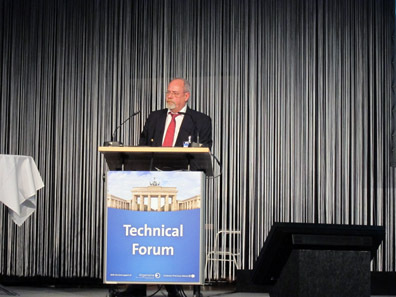 Hermann Schürer (Economa) informed about his ‘Give away recovery system for silver bullion coins’ which could save enormous costs to the mints. Generally a tolerated range of overweight results in among 30 mg / ounce of lost silver during the production of silver bullion coins. To a big mint this can amount to millions of dollars over the year. Economa has developed a machine that handles and analyses coins with a capacity of processing about 34 pieces per minute. Additionally the system weights the coins removing mechanically the metal surplus. The recovered scrap can be recycled without contamination. Dr Thomas Gräbener, Gräbener Pressensysteme. Photo: BS. ‘Minting’ was the forum’s penultimate section. 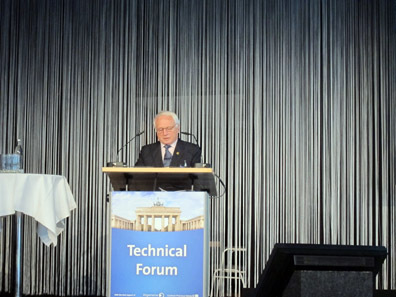 Dr Thomas Gräbener (Gräbener Pressensysteme) presented not only the new firm logo but also the most recent product of his company: ‘FlexMedal – the Small but Mighty Medal Press’. FlexMedal steps up with the promise to enhance the traditional and powerful but not flexible knuckle-joint press with a servohydraulically controlled power unit. This permits, according to Dr Gräbener, multiple stroke with variable forces and die lifting, a user-friendly control and an effective sound protection. Juan Manuel Shiguetomi, Mexican Mint. Photo: BS. 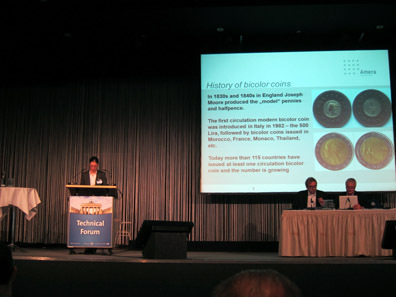 Juan Manuel Shiguetomi (Mexican Mint) presented ‘Shaped Bi-metal Coins’ of his mint. Over the last years the Mexican Mint has produced various shaped bi-metal coins and will continue doing so by testing new designs and metal combinations which have already led, per instance, to tri-metal coins. Christophe Riboulet, Proditec. Photo: BS. The last presentation focused on ‘Inspection’. 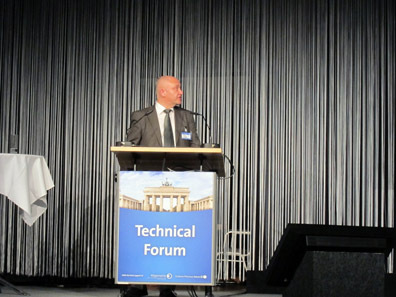 Christophe Riboulet and Eric Sanquer (Proditec) spoke on ‘Blank Inspection – New developments and user feedback’. They gave some interesting insights in how important it is to listen to customer complaints in time because adjusting the product in an early stage is, in the end, much more efficient than testing only in a final moment. Proditec produces automatic inspection machines particularly for minting production. 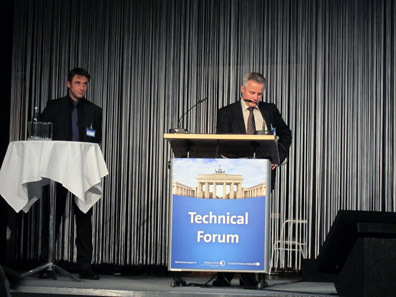 At around 7.30 PM the presenters, Dieter Merkle and Thomas Hogenkamp, closed the forum with a short summary of all the given presentations and, last but not least, the audience moved over to the Paris room where drinks and snacks expected the guests. Schuler Pressen and Spaleck sponsored this Get Together offering thus not only the possibility of chatting and networking but also of simply enjoying a harmonious and tasty time concluding in this way an informative and productive day.